(To Make 4 Sandwiches) Cook the onions, about 3-4 heaping tablespoons per sandwich. When they are golden brown, throw about a half a pound of the meat on the flat griddle. Season with salt and pepper. Start chopping at it with your stainless steel spatula. (Wield that spatula confidently, as if you’ve done this a million times before. This is optional.) When the onions and rib eye are done, open up the 12-inch long white bread and squeeze or slather the Cheez Whiz along the sides. (This is where arguments ensue. Some folks slather the cheese on top of the meat.) 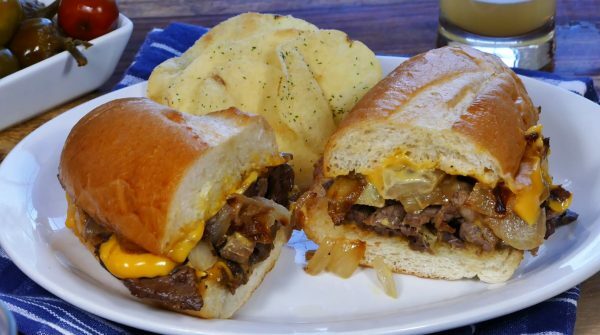 Give the grilled steak and onions a quick little mix together and then, with your tongs, pile the mixture on the bread. That’s it. You’re done. Dive in.